Mark Twain once said “wrinkles should only indicate where smiles have been.” But what if we would rather have the memory of those smile-inducing moments rather than the evidence of them on our faces? Smile lines are those less than desirable creases running from the side of our nose to the corner of our mouth which deepen and become more pronounced due to loss of facial volume and skin elasticity. These lines can often make us look old, tired or unhappy and sometimes all three. At Eos Rejuvenation, we effectively use Juvederm and Restylane to smooth out your smile lines, restoring youthfulness to your face. Additionally, we often suggest combining these dermal fillers with skin rejuvenation treatments such as Botox, for an overall improvement to your appearance we call a “liquid” facelift, without the cost and downtime of surgery! Additionally, when combined with cheek augmentation (i.e. lifting the cheeks with filler), your smile lines will also improve (try looking in the mirror and lifting your cheeks to see the improvement in your smile lines). After applying a topical anesthesia, smile line fillers are injected using state-of the-art micro-cannulas to minimize discomfort, bruising and swelling after the procedure. 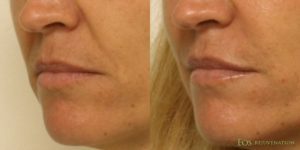 Dr. Nima has perfected this technique to virtually eliminate any tell-tale bruising, which is especially helpful to our Beverly Hills patients who require blood thinning medications. Although the procedure may take only a few minutes the results can last up to 18 months, with a touch-up procedure recommended at around 9 months. Of course, adopting a personalized skin care regimen to keep your skin healthy and glowing will extend any results. We highly recommend you scheduling an appointment with our aesthetician for a consultation. If you are about to undergo a smile line procedure, avoid alcohol a week prior, and stop using aspirin and anti-inflammatory medications such as ibuprofen, Advil and Aleve 10 days beforehand. These medications can increase the chances of bruising. Also, smile line fillers should not be used by pregnant or lactating women. If you are ready to schedule your Restylane consultation with Dr. Nima, contact our office in Beverly Hills at (310) 772-2866.